What more could Tobias Sammet do to make his Avantasia project more outrageous, bombastic and, if you're a fan, which I am, more awesome? Hire a professional orchestra for the symphonic parts. In this case, Sammet hired the 60-piece orchestra, the German Filmorchestra Babelsberg (Rammstein, Celine Dion, Bryan Adams). Of course, for The Mystery of Time, which explores the quick passing of time, Sammet also pulls out some of his old tricks out of his black bag of melodic metal. There's the cast of world famous vocalists and musicians, good song writing with dense epic arrangements, and steely crystal clean production. As usual, his vocals are at the forefront, mostly outpacing his guests, with the possible exception of Bob Catley (Magnum) on the Great Mystery. Essentially, Sammet has already written his own review of The Mystery of Time. He states in promotional material, "I just wanted it to be a little bigger and more opulent than it had been in the past. Something between Richard Wagner, Meat Loaf, Queen and a freight-train at high speed!" There you have it. Certainly, the album opens this way with Spectres, then Where Clock Hands Freeze, Savior in the Clockwork, and Loaf-ish closing epic, The Great Mystery only confirm the formula. The album contains two ballads. Sleepwalking released as a single and a video (see above), and What's Left of Me, more a power ballad. The only disappointment, though certainly not a bad song, is Black Orchid as it didn't seem to carry me along with it. Finally, in comparison with the two previous albums, The Mystery of Time isn't quite as dark, having that more friendly Edguy upbeat power metal feel. Some have been calling this the best Avantasia yet, and this may be true. It does prove that Tobias Sammet has every reason to keep the project going. Easily recommended. 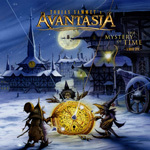 With Avantasia's The Mystery of Time, Tobias Sammet brings a single concept in a concise album, and then hires a professional orchestra to make his bombastic power metal even more epic.